Become a Math Lawyer, Defend Your Answer! This poster/label set reminds students that solving a problem is more than just writing down an answer. It gives them several checkpoints to consider, including, “Does your answer make sense?”. I frequently pair up students to “defend” their answers. It’s a great way to have them recheck their work before turning it in. It also encourages math conversation. The labels make good reminders when attached to their math journals or notebooks. 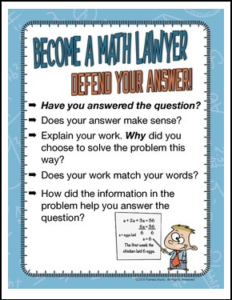 This set includes the Math Lawyer poster, as well as a template for labels that fits Avery Labels 5168, 3 1/2 X 5″, in color and a BW version for kids to decorate.